If you like listening to loud music, a hard rock aesthetic and cycling... the Teknik Hell bib shorts are the garment you need when riding. 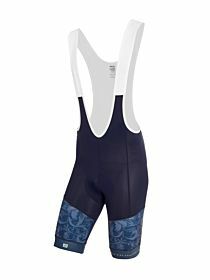 The Teknik Hell bib shorts will soon become a comrade in arms. Their strong aesthetic is no obstacle to comfort, capable of enduring the most arduous of rides. Test for yourself the ErgodryFresh® bi-elastic fabrics we have used. Their elasticity and compressive action will surprise you, and help you achieve greater pedalling precision and correct blood flow. Made with sublimated ErgodryFresh® bi-elastic fabrics. Flatlock seams to avoid rubbing and enable greater elasticity. Tight pattern. Compression action for greater pedalling precision and correct blood circulation. Spiuk Gallio Pro pad, optimised for excursions of up to 5 hours. Reinforced braces with broad Sensodryfresh® mesh areas that favour heat evacuation. In addition to sweat absorption and evacuation. Extensive non-slip strips on cuffs, to avoid pressure points and discomfort. • For up to 5 hour rides. • Chamois pad featuring foam with 3D moulding. • For road cycling and MTB. • Rapid sweat transpiration. Highly efficient moisture management. • Antibacterial carbon inserts offer increased breathability.